This formula has all the benefits of Green Screen Original SPF 32, but is tinted to blend with skin tones and is excellent for facial use. Peach is a pinkish beige tone created by the mineral cosmetic pigment iron oxide. Iron Oxide is the same biomineral that makes blood look red. Peach is designed for people who have skin with a warm pinker undertone, yet light complexion. Great for Northern and Eastern European heritage, with skin that can tan relatively easily. Excellent for facial use and may be applied to reduce blemishes and blend sunspots. Green Screen Organic Sunscreen SPF 31 Peach is easy to apply at all temperatures and blends with skin tones, eliminating the cool chalkiness that mineral sunscreens may impart. Green Screen Organic Sunscreen SPF 31 Peach is healthy, highly effective and safe for children and adults of all ages. SPF 31 provides 97% UV absorption. Formula is broad spectrum and effective for protecting your skin from both UVA and UVB radiation. You can use it daily and be confident that it's free of harmful petrochemicals that are known to bioaccumulate. 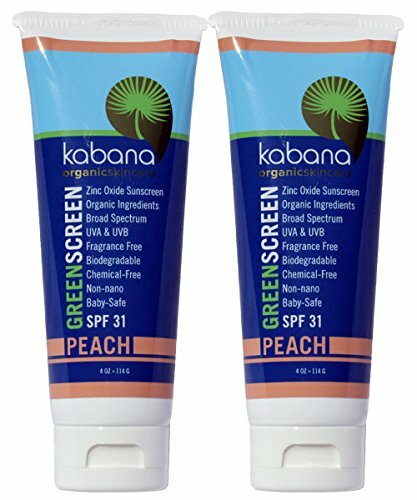 Zinc oxide is a better sunscreen active ingredient than titanium dioxide and the only one Kabana uses for the following reasons: Zinc oxide the most effective UV absorber across the entire UVA and UVB spectrum. ZInc oxide is made from the critical mineral nutrient zinc instead of the toxic heavy metal, titanium. Zinc oxide holds tight to its electrons when it absorbs UV energy and limits the creation of free radicals that do damage and increase the risk of skin cancer. Zinc oxide is the sole sunscreen active ingredient approved for use on children by FDA. The zinc oxide Kabana uses is non-nano, and not-micronized (it is not crushed to size which produces nanoparticles); there are zero zinc oxide nanoparticles in our formulas. If you have any questions about this product by Green Screen, contact us by completing and submitting the form below. If you are looking for a specif part number, please include it with your message.